Though aimed squarely at the serious hi‑fi market, this class‑leading converter has plenty to offer in the studio. The new ADI‑2 DAC is, essentially, a simplified version of RME’s ultra‑impressive ADI‑2 Pro A‑D/D‑A converter, which I reviewed in April 2017: http://sosm.ag/rme‑adi‑2‑pro). Intended to appeal to the serious domestic hi‑fi market, this latest product has lost its sibling’s A‑D conversion facilities — but as you’ll see, it’s more than just a D‑A converter, and the reduction in functionality brings with it a substantial drop in price. Despite the primary targeting of the hi‑fi market, the ADI‑2 could undoubtedly serve a valid role in the studio as part of a very high‑quality monitoring chain, with its state‑of‑the‑art converters, versatile DSP, and a fully balanced and DC‑coupled analogue signal path. The ADI‑2 DAC occupies a 1U half‑rack case, just like the ADI‑2 Pro, but now it’s black, which looks very stylish. It’s powered in the same way as the Pro model, with an external ground‑free (double‑insulated) line‑lump that accommodates any mains AC voltage between 100 and 240 Volts. The power supply’s coaxial DC connector is a secure bayonet‑locking type (accepting 9‑15 Volts DC, so the unit can also be battery powered), and alongside this DC input is a USB 2.0 B‑type socket for bidirectional interfacing with a computer. 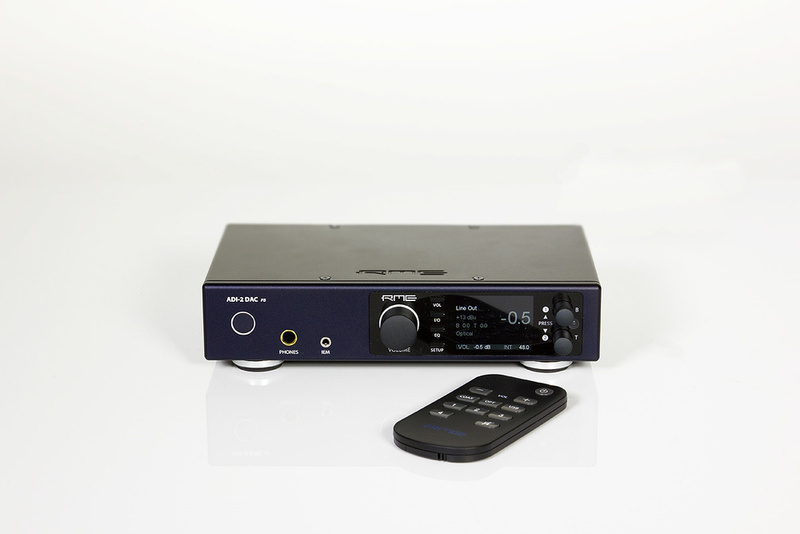 The physical inputs comprise a pair of S/PDIF ports, one the usual coaxial RCA phono socket (which also accepts AES3 signals via an adaptor), and the second an optical JIS F‑05 ‘lightpipe’ Toslink port. Unusually, the optical port can also be configured to accept channels 1 and 2 from an eight‑channel ADAT data stream. Audio sources in a computer can also be played back through the USB 2.0 connection, of course, and all the usual PCM digital sample rates between 32 and 768 kHz are supported, as well as DSD (DSD 64, 128 and 256 variants via the DoP format). The bidirectional USB connection allows digital signals received at the S/PDIF or ADAT inputs to be routed into the computer, so the ADI‑2 DAC can serve as a basic digital‑source computer interface. As usual, RME provide an ASIO driver for use with Windows operating systems, but the unit is UAC 2.0 class‑compliant, so doesn’t need drivers for Mac OS or iOS systems. RME’s renowned SteadyClock clock‑recovery system has also been updated, acquiring the suffix ‘FS’. The upgrade has apparently improved the unit’s internal jitter performance to such a degree that it is now measured in femto‑seconds (10^15th, or one quadrillionth, of a second). Most converter clocks’ jitter performance is measured in pico‑seconds (10^12th, or one trillionth, of a second), so this is a significant improvement in performance. Regardless, the SteadyClockFS system cleans up any timing unsteadiness in the embedded clocks received at the digital inputs and — especially importantly — from the USB input, giving a rock‑solid performance under all conditions. 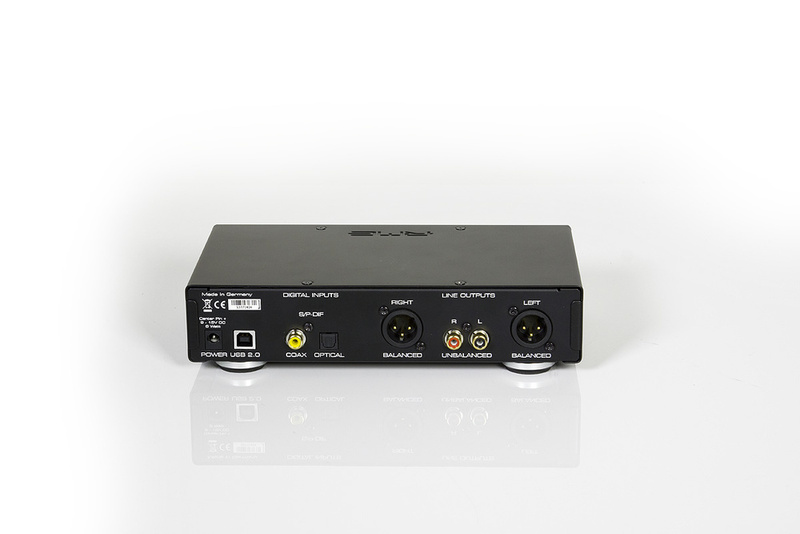 The digital inputs allow the ADI‑2 DAC to function not only as a D‑A converter for playback from computer systems, but also as an audio interface for digital sources. The analogue outputs are generated by AKM’s AK4490 D‑A converters, which are the same converters as employed in the Pro model, and the rear panel provides both balanced and unbalanced line‑level outputs on XLRs and RCA phono sockets. The front panel features a standard quarter‑inch TRS ‘Extreme Power’ headphone socket, together with a 3.5mm mini‑jack TRS socket, labelled IEM and intended for earphones. This is in contrast to the ADI‑2 Pro, which featured two full‑size headphone sockets, both with RME’s ‘Extreme Power’ headphone amplifiers, and with the capability of being configured to drive true balanced headphones — an option which has been deleted from the ADI‑2 DAC. However, the reallocation of one of these outputs for ‘IEM’ purposes in the ADI‑2 DAC involves more than a simple replacement socket. Since in‑ear monitors (earphones) are generally a lot more sensitive than conventional headphones, the gain structure for this dedicated IEM output has been revised to reduce the risk of hearing (and earphone) damage, with the added benefit of lowering the (already very quiet) noise floor by 10dB. And the IEM headphone feature isn’t the only output format modification from the ADI‑2 Pro. The rear‑panel analogue output circuitry has also been altered to provide more hi‑fi friendly interconnectivity, improving the noise floor and distortion specs in the process. There are still four selectable analogue output level options (with variable trim), but they now provide slightly lower peak levels of +19, +13, +7 or +1 dBu at the XLR outputs, and the RCA phono outputs are 6dB lower at +13, +7, +1, and ‑5 dBu. (For comparison, the ADI‑2 Pro delivered +24, +19, +13, or +4 dBu at the XLR outputs.) But while the ADI‑2 DAC’s reduced peak output options are intended to optimise hookups with hi‑fi equipment, they will probably be more convenient in the context of a typical project studio’s active speaker monitoring, too. As with the Pro model, the ADI‑2 DAC’s technical specifications are exemplary, and I measured its A‑weighted AES17 dynamic range performance as a shade over 120dB, which agrees with the published specs and is a genuinely high‑end performance standard, matching the Lynx HiLo. The user controls are configured exactly as on the ADI‑2 Pro: the unit is switched in and out of standby via a flush‑mounted button with a red illuminated collar, which is to the left of the headphone sockets. A large rotary encoder (with detented action and a press‑switch function) defaults to adjusting the main volume, while four buttons to the left of a very crisp colour screen provide direct access to the various system menus. Two more, smaller, rotary encoder/switches on the right‑hand side of the screen are used to select and adjust the various parameters and settings within each menu screen, and this all works in exactly the same way as the ADI‑2 Pro. As befits a hi‑fi product, there’s a bespoke wireless remote control, with dedicated buttons for power on/off, volume up/down, output mute, input source selection, and four user‑customisable keys. These can be programmed by the user from 22 different functions, but I imagine most will use them to switch between saved setup configurations. Another hi‑fi‑oriented addition is a new ‘AutoDark’ mode, which turns off the display and all button illuminations after 10 seconds of inactivity (everything lights up again when any button or control is touched, or if a remote control button is pressed). The idea is obviously to minimise visual distractions, but for those that like visual distractions, the screen can also be configured to show a variety of different metering and status displays in different colour schemes. In all other respects, the ADI‑2 DAC is much the same as its professional sibling, including the same five‑band parametric EQ facilities (with 20 user‑preset memories), separate bass/treble tone adjustments, a very clever loudness‑compensation mode, and Mid‑Sides conversion facilities. There are also headphone crossfeed options (which are also available on the line outputs, bizarrely), a 30‑band spectrum analyser, peak meters, numerous different D‑A reconstruction filtering options, automatic line output muting when headphones are plugged in, ramping volume when powering up... and so on. Every aspect of the unit’s configuration can be saved in one of nine user memories, along with the factory default condition, and any of these can be allocated to the four programmable buttons on the remote control, for quick system reconfigurations. It’s all very powerful and elegant, and easy to use with a little familiarity — and the ring‑bound 68‑page A5 manual explains everything superbly! For anyone who doesn’t require the Pro model’s A‑D conversion features, the ADI‑2 DAC should be a very attractive option indeed, not least because it costs around 40 per cent less than its bigger sibling. It is an appealing and cost‑effective option as a (very seriously) high‑end digital‑source hi‑fi preamp, or as a project studio monitor controller, or as a headphone amp — or all three! Overall, this is a very intelligently and skillfully remodelled version of the ADI‑2, and I am very impressed with all that it can do, and the ease and quality with which it does it! Elegant control and configuration options. AutoDark mode is a nice touch. Retains interface functionality, with ability to route digital sources over USB. This less costly variant of the ADI-2 Pro lacks that model’s A-D facilities, and some functionality tweaks have been implemented to suit a slightly more consumer-oriented role — but without compromising the exceptional quality. Synthax +1 754 206 4220.